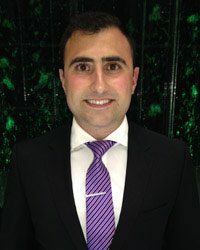 Dr. Joseph Hasso completed his undergraduate studies at McMaster University where he completed the Bachelor’s of Health Sciences Honours Program in Hamilton Ontario. He further went on to pursue his passion for dentistry and received his Doctorate of Dental Surgery from the University of Toronto in 2014. At the University of Toronto, Dr. Hasso has always been involved in student life and taken on many leadership roles including Class President and Chapter President of Xi Psi Phi International Dental Fraternity in which he is still an active member. In 2014 he was awarded most Outstanding Chapter President in all of North America for his efforts and dedication. Dr. Hasso places the utmost importance on patient care and always seeks to further his education and clinical skills. He is a member of the Ontario Dental Association, the Academy of General Dentistry and the Royal College of Dental Surgeons of Ontario. Dr. Hasso’s interest in Dentistry was sparked early in his life by his grandparents who are both retired dentists. Outside of practicing dentistry, Dr. Hasso loves spending time with family and friends as well as being active, playing sports and travelling.